If you read Fashion, Frankly regularly you will know by now that if there is a particular item I can never have enough of in my wardrobe that is shoes of any style. I tend to buy an average of a pair a month, which keeps me cheeper for a few weeks and normally doesn't hurt my credit card too much. This month I wanted to find a pair of Nike sneakers I could wear in the winter. I love my Free Run's and Roshe Run's but they simply aren't a good fit for the cold London temperature. 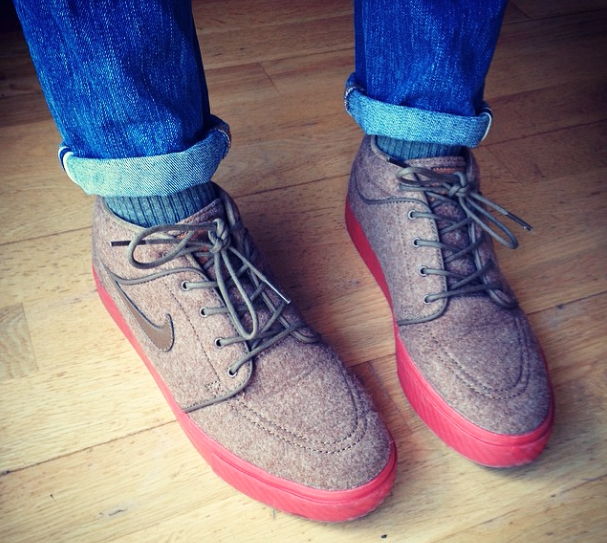 That is why these Janoski Mid Wool style couldn't be better. With a wool upper part, sturdy sole and cork insole they really insulate my feet from the winter weather. Because they are made of such an unusual material for sneakers they add great texture to my classic clothes. The striking red sole is also an easy way to inject some colour into my dark(ish) looks. As well as in brown, they are available in a beautiful shade of grey, also with the red sole. They're both a perfect match for your blue jeans but look fantastic with black and grey too. You can get them here.